I was torn between two ice cream flavors. So, rather than choose one over the other, of course, I went with both by combining them. I’d been inspired by the collection of coffee desserts in The Modern Vegetarian . I had my eye on the Cafe Latte Ice Cream and Coffee Tuiles. In the book, this is shown with long, pointy shards of espresso-flavored tuiles jutting up from the top of a scoop of ice cream. It’s dramatic and delicious-looking and was something I had to try. But, there was another ice cream on my mind as well. A Chocolate-Hazelnut Swirl number from the LA Times had taken up residence in my food thoughts, and it couldn’t be ignored. 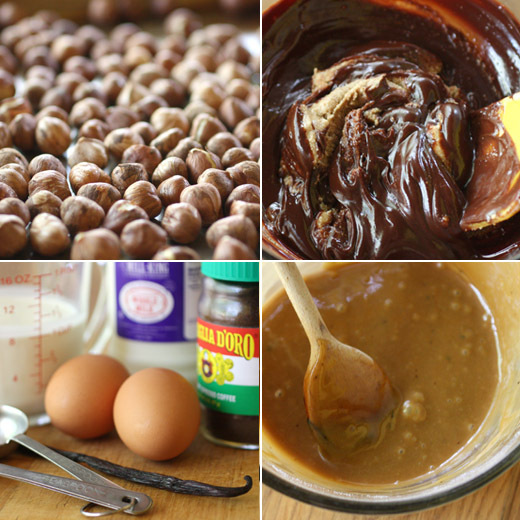 I decided: why not add the chocolate-hazelnut spread to an espresso ice cream rather than to vanilla? And, that’s how this flavor combination was born. When your ice cream is almost finished churning, you just spoon in some Nutella or homemade gianduia. It swirls its way through the ice cream and turns into cold, fudgy bites here and there. While the ice cream firms up in the freezer, the tuiles are easy to make since the batter is baked in one, big thin piece and then broken after it cools. To start the ice cream, I actually didn’t follow the exact recipe in The Modern Vegetarian. I have a favorite vanilla gelato that I always make that has more milk than cream and is a little lighter. I followed the usual procedure for making that vanilla base, but I steeped some instant espresso granules in the milk as it heated before straining it and proceeding with tempering eggs and making the custard. I used two tablespoons of instant espresso, but you could also use a quarter cup of roasted coffee beans. I let the milk sit and steep for 20 minutes or so, but with whole beans, you’ll want to give it an hour. While the custard chilled before churning, I made homemade gianduia with roasted hazelnuts, semi-sweet chocolate, cream, and butter. When the ice cream was churned, I added about three-quarters cup of the chocolate-hazelnut spread just before it was finished. The ice cream went into the freezer for a few hours before serving. The coffee tuiles were made from an easy batter started with three tablespoons of melted butter and two teaspoons of instant espresso granules. That was stirred until the espresso dissolved. Four and a half tablespoons of flour and a quarter cup plus one tablespoon of confectioners’ sugar were sifted together, and an egg white and the melted butter mixture were stirred into the flour with a wooden spoon. The batter should be beaten with the spoon until it forms a smooth paste. The batter was chilled in the refrigerator for ten minutes or so, and then it was spread very thinly on a silpat-lined baking sheet. It was baked at 350 degrees F for ten minutes. Check it after five minutes to see if it's set and browning at the edges yet. The baking time will depend on how thinly the batter was spread. Once cool, the big, thin cookie can be broken into shards. 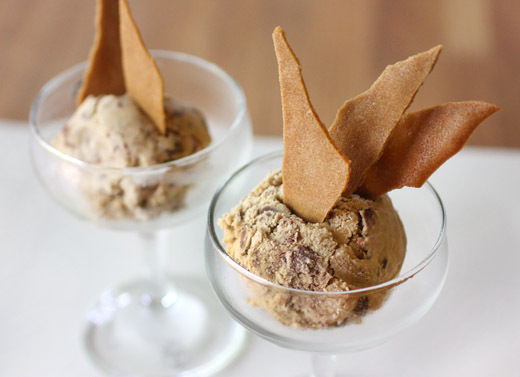 Those crunchy, coffee tuiles work perfectly as ice cream delivery devices. No spoons or gelato shovels are required when those are on hand. And, coffee and chocolate-hazelnut belong together. Why settle for one or the other when you can have both? My lack of decision-making skill worked to my advantage this time. This looks amazing, some of my favorite flavors and textures all in one. A perfect summer dessert! There is not one word of that title that I don't love. Sounds so good! Heaven in a bowl! Those are wonderful flavors. Your ice cream is so irresistible. Looks absolutely irresistible! Good that you have combined two in one terrific summer treat. Brilliant idea to combine the flavors! A definite win for indecisiveness. And I love the idea of using the tuile as a scoop! Such a great dessert! And perfect for this time of the year (although I'll eat ice cream anytime!). Great pictures - thanks. uh, this is definitely in the running for most phenomenal batch of ice cream ever. well done! Looks sooo good Lisa! Love coffee tuiles topping, looks so elegant! How I wish I had a few dollops of these right now! 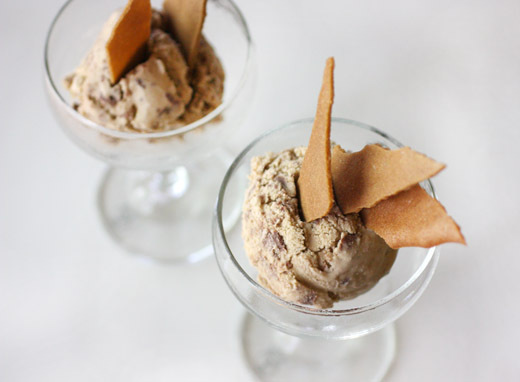 Nothing beats a nice espresso ice cream on a hot summer day. And this one, combined with hazelnut and chocolate sounds divine. This sounds so good. The tuiles look great too. The few times I've had homemade ice cream, I've been in love with it! Oh this is just blissful Lisa. By sheer coincidence I scoffed a pot of hazelnut ice cream yesterday afternoon and it was just the perfect tonic! I imagine the chocolate and espresso flavours pair really well here! Sounds like the perfect combo to me!!! Awesome is the word to describe this recipe. The tuiles are just great addition to this wonderful ice cream. I loved this recipe. Pinned it! That looks so delicious and I applaud you combining flavours rather than choosing one. You do know that espresso and chocolate is perfect together, a marriage made in heaven?! What fabulous ice cream and oooh I want some. The tuiles look and sound great! I love this dessert!